ZIMBABWE – President Robert Mugabe’s incumbency is a threat to reform and development and Zimbabwe will remain cocooned in an economic logjam until there is a clear succession plan in Zanu PF, an international think-tank has observed. In its latest report, the International Crisis Group observed that Zimbabweans desperate for economic revival would have to wait a little bit longer until Mugabe’s departure. The report said the waning economic fortunes in the country would persist as long as Mugabe remained in control and unable to resolve the raging succession wars in his party and embrace policy changes on the country’s controversial indigenisation laws and land reform. A leadership vacuum, the report dated February 29 observed, factional infighting in Zanu PF and across the political spectrum and policy inconsistencies, had complicated and further blunted Zimbabwe’s chances of economic revival. “Efforts to develop and support reforms are tampered with by the nonagenarian President’s incumbency,” the report read. Zimbabwe is facing a serious economic crisis that has resulted in the closure of companies, with only 700 000 of the 13 million people in formal jobs, while the rest have resorted to informal trading such as vending. With the current El Nino-induced drought, many Zimbabweans are in dire need of food aid, as the economy continues to underperform with very limited positive trends to ignite a ray of hope in the impoverished citizens, the report noted. “The few positive trends do little to improve the lot of most citizens or provide confidence in processes to build a constitutionally-rooted social contract,” the International Crisis Group report observed. Zanu PF is currently locked in bitter succession fights pitting Vice-President Emmerson Mnangagwa against G40, a faction that reportedly has the backing of First Lady Grace Mugabe among its ranks. 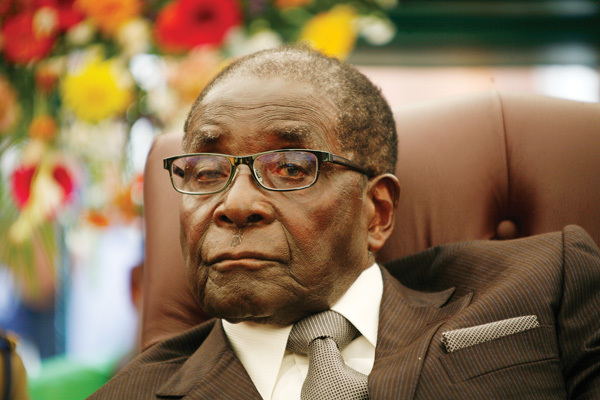 At 92, Mugabe’s advanced age has sparked serious infighting in the ruling Zanu PF, which he has struggled to contain for the past three years, as party hawks try to manoeuvre their way to strategic positions in the post-Mugabe era. The report added Zanu PF was its own biggest threat. “Its constitution is unclear about how to select a new party leader and, by extension, president if Mugabe becomes incapacitated or dies in office. That the party will not countenance open debate on this has led to incessant backroom political jockeying and unprecedented turmoil,” it said. According to the report, Mnangagwa was looked at by the international community as the only pragmatic person to revive the country’s economy, but he faces a serious internal revolt and the rise of Grace has weakened him drastically.